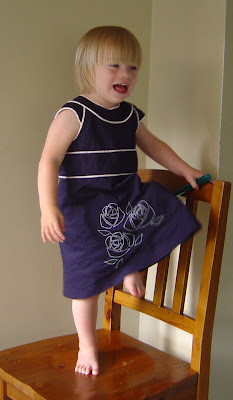 Everything Just Sew: I can be quick! I confess this post is pretty much only here so that I can have a slight smirk at Keely. We ordered some Hotpatterns weeeeeeks ago. (By "we" I mean she placed the order and I took advantage to piggyback!) The original order never arrived, so Hotpatterns resent them and they arrived yesterday. While texting Keely during the day arranging to pop out to her place to pick mine up, I smirked that maybe she'd like to bet on whether I could get the 3 graces top I've been dying to make done by today. She sensibly didn't take the bet! Got home 8pm-ish and got to work tracing and cutting my trial version. If this one works, yippee! If not, no big deal. Um, yeah, those instructions are brief. I labelled the twisty seams and spent a while staring blankly at the instructions willing them to suddenly become clear. Eventually I just tried different configurations until I think I got it right. I wasn't prepared to sew at that point so left it till this morning when I could check the EXTREMELY helpful video Trudy has made demonstrating how it works. It's very easy to sew, but not easy to figure out. And it looks like this. For the record, I cut a size 8. 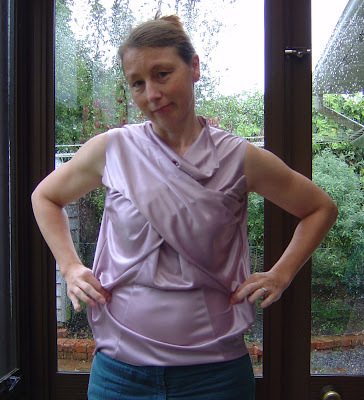 I didn't bother with sleeves, but I think the armscye will be fine (the weight of sleeves will pull the shoulder seam a bit further towards my shoulders. If I add sleeves. I may just finish the armholes and leave it sleeveless). My fabric is very very drapey and I like how it hangs. Back. See how it's pooling on my hips? But there's heaps of room around my waist. In a bit at the waist is easy enough to alter on this version, but out at the hips will have to wait till next time. 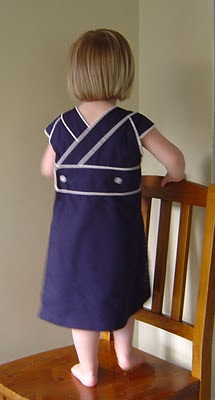 Meanwhile, here's that navy dress I was making for Isabella on her. Boy it's hard to photograph an excitable two-and-three-quarter year old! 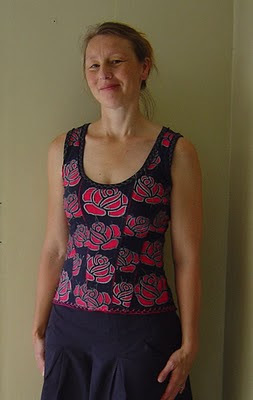 Oh, and my latest Alabama Chanin corset. The fit of this one is better than the red and cream version (I made a small instead of a medium), but after I'd cut it out I remembered that I wanted to dip the hem at the front a bit more so it's more like the dip at the back hem. Ooops. The girls at our craft group immediately guessed that this means I need to make another one. They know me well. 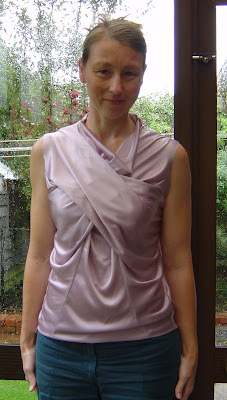 I keep eyeing that particular HotPattern design as I love the unique draping. But those HP just don't seem to work for me. I also am intrigued by that hot patterns design if only for the fact that it is one design I could never wear. You can though, and you are rocking that look! Some more great work, on your other projects - Isabella looks gorgeous.